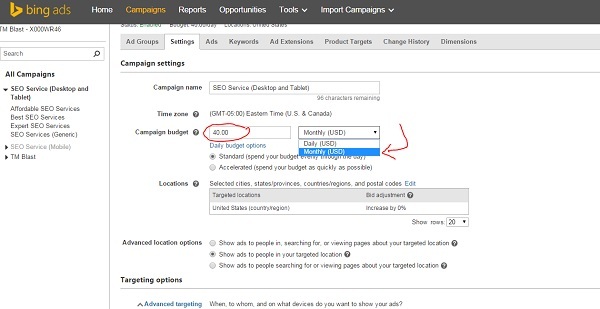 Limited by budget in Bing Ads will restrict your campaign’s performance. In a nutshell, the only true way to fix this message is to up your budget on your campaign. 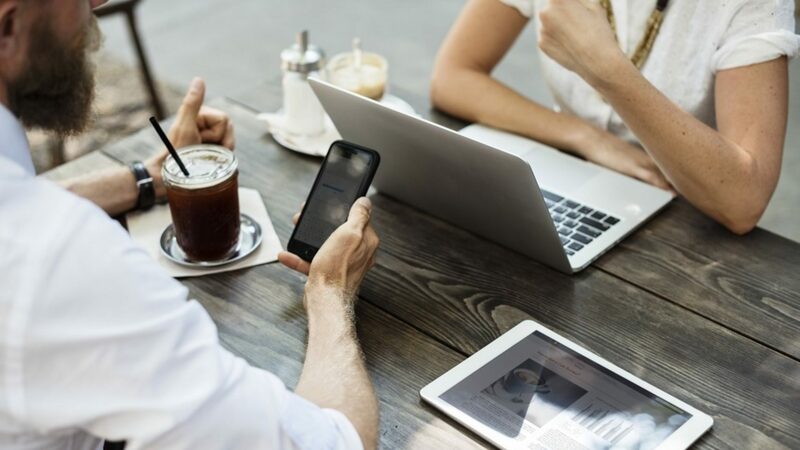 However, if you only have so much money to work with, you can read how to better maximize your campaign to fall into your daily bid budget. Here are 3 steps to fix this message. After running a PPC campaign for some time, you will add, pause, delete, change the bids, and more for your keywords. By doing this, you might still have the same daily budget set up for your campaign. Maybe that $40 a day budget is getting squeezed because this is the busy season and your competitors are upping their bid. Regardless, you will see this message below. The message is the limited by budget message under the delivery column. Before we get too far into this post, I want to stress that there are many factors that need to looked and when getting this message. Factors like seasonality, factors like competition and more need to be considered. For this blog post, I am showing what I did for my account. Since this blog is just run by myself for learning purposes, I don’t want to get into a bidding war, so I need to find a way to stay in the $40 a day budget for this account. What Does Limited By Budget Mean in Bing Ads? In a nutshell, your ads and keywords will still show, but with the budget being limited, Bing will restrict how often your ads are able to be seen for your keywords. What does that mean? Well, I have my settings set to $40 a day. What happens is that when I approach that budget, Bing will start showing my ads less and less throughout the day to make sure I am not going over my daily budget. When this happens, I am being seen less and less for key terms for my campaign. How Can I Figure Out How Much I am Over My Daily Budget in Bing? It’s actually pretty simple. You need to head over to the campaign you are limited by budget, sort by keywords, download the keywords into excel, and then add up the columns for the daily budget. As you can see here, my keywords are showing up with about $130 for what I am telling Bing to bid me on. However, I have my budget set to $40 a day. That is why I have that message in Bing Ads about this problem. With the settings I have set up, I am $90 over. What are the Solutions to Fix This? There are many options that we can take to fix this issue. I would recommend looking at what makes sense for your goals honestly. You can either up the budget or delete some keywords. Can I just Pause My Keywords to Lower the Amount of Budget Set Aside? The answer is no. The reason this is the case is that I could activate a paused keyword at any time, so Bing Ads will factor a paused keyword into the equation. With that said, I am going to start with the paused keywords. Most likely, I paused the keywords a long time ago and forgot about them. Before I start though, I’ve gone through all the historical data for my campaign. I’ve looked at metrics like impressions, clicks, click through rate, conversion rate, cost per acquisition, quality score, and more to make the determination if I should delete the paused keywords. Here are the five keywords I will be deleting. While this might not seem like a lot, I will be knocking off a total of $31.88 right there off the $90 difference. That already comes out to $58.12 over without really doing much! Just like the pause deleted keywords steps, I am going to look at the active keywords and see what I can take out. This chart looks pretty confusing, so I am going to highlight the five keywords that have a low quality score, no clicks, and no conversions. By deleting these five keywords based on those reasons above, I am cutting off a total of $23.50 for the daily keyword bid. With that, I am now $34.62 over my budget. Remember, I started at $90 over my budget, but now I’ve taken it down to $34. That’s pretty good! Knowing that I am still $34 over my budget that I am willing to spend, I am going to take a second pass at this. Now, I am going to focus on keywords that have a low click through rate, high cost per click, and no conversions during the lifetime of this campaign. Again, I am going to highlight those terms now. These terms below make up a total of $36.51. Now, I am under my daily budget allocated! Now that I am under budget, I want to review my negative keywords. I might still be putting money into keywords that are not ideal for my campaign. If want to learn how to do this, I wrote about how to create negative keywords in Bing Ads here. Here are two keywords that I find not helpful for my campaign. Just for safety, I am adding those as negative keywords via the campaign level. Every bit of money saved is fine with me! I could just up my daily budget. This can be a great idea for testing purposes. In fact, I would recommend companies look into this feature if they just started in Bing Ads. Later on, you can make changes to your account based on the historical data like I just did above. In this picture below, you can see that Bing Ads is showing me the amount of impressions and clicks I could get with playing around with the budget. Another option I could of done is manually adjust the bids on my campaign. This would be a small change in general, but it would allow myself to really look into all of the keywords at a micro level for my campaign. Instead of having a daily budget, I could set up a monthly budget in Bing Ads. This could be a better option for campaigns that know how much they are looking to spend every single month in Bing Ads. If you see the limited by budget message in Bing Ads, you should first act upon it. You are actually hurting your campaign at the macro level when you are not addressing this problem. 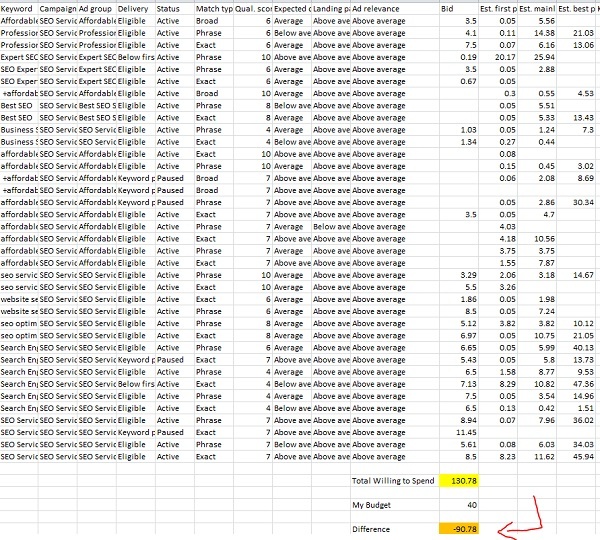 If your campaign has a lot of data, I would recommend exploring some of the options that I listed above to see where you can save money with your campaign. You might even improve the conversion rate and cost per acquisition by getting rid of some of the lower performing keywords.